I have an interesting history of burning things in the oven. It’s so ridiculously simple: you pop it in, you twiddle your thumbs, you take it out. Easy-peasy. Unfortunately, one of my less admirable traits is my forgetfulness… And needless to say, forgetfulness and ovens do not mix. I’ve burnt cakes, chicken, vegetables, tea-towels – you name it. But sometimes, with strong emphasis on the >1% change of this happening, it turns into something quite lovely! Trial by burning is not a cooking method I advocate. Do not try it at home. 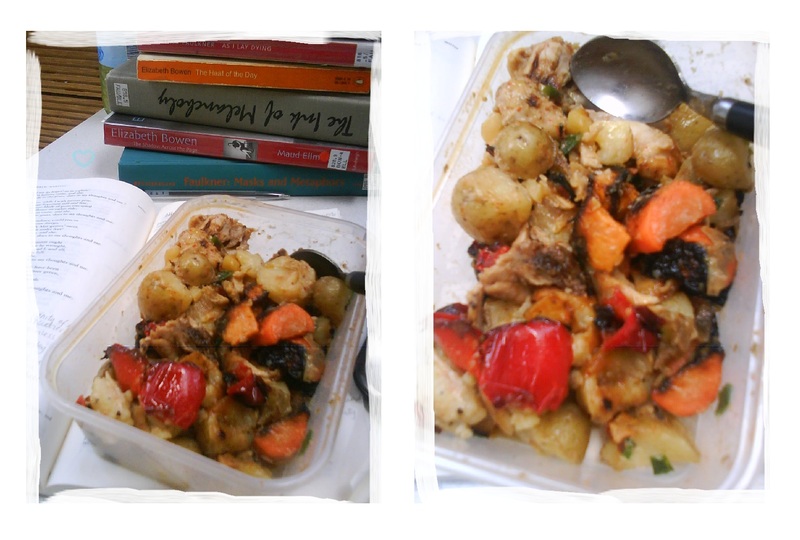 This is a super quick recipe I threw together during essay-crisis for a gruelling stint in the campus library. Needless to say, the housemates were more than a little perturbed to smell singed vegetables at 730AM. However, lightly char-grilled veg works a treat in this sticky, sweet roasted potato salad. 1. Pre-heat fan oven to 200°C, set on fan + grill if possible. A light charring on the veg and nicely browned chicken means you’re good to go! 8. Eat warm or box for later! As always, comment if you’ve any queries and let me know how you get on!